Here you can find a strain description about Grape Afghan Kush and also some user-based reviews and infos directly from the SeedFinder (if available). 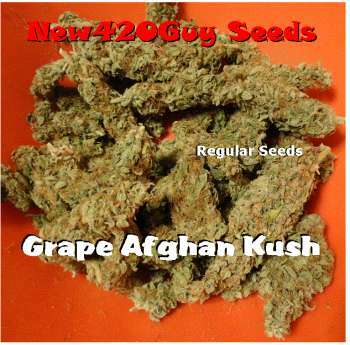 You can also find the offers and auctions here if Grape Afghan Kush cannabis seeds are on stock at MyCannapot right now. It will provide big fat very frosty buds with a wild grape-Afghan smell. Average indoor yield is 2 oz. per plant if vegged for 2 full months. Excellent meds for pain, stress, depression, insomnia or nausea. Flowering period is 9 to 11 weeks. Grape Afghan Kush is not available at our shop at the moment!